Outside the Box: Peacock Feathers and Glamour! Yes that is what this picture says to me, it was chosen by Ina for the latest Colour Challenge at the Outlawz! Isn't that gorgeous! This week we would like you to pick three colours from the five shown and add the twist (which won't be difficult!). 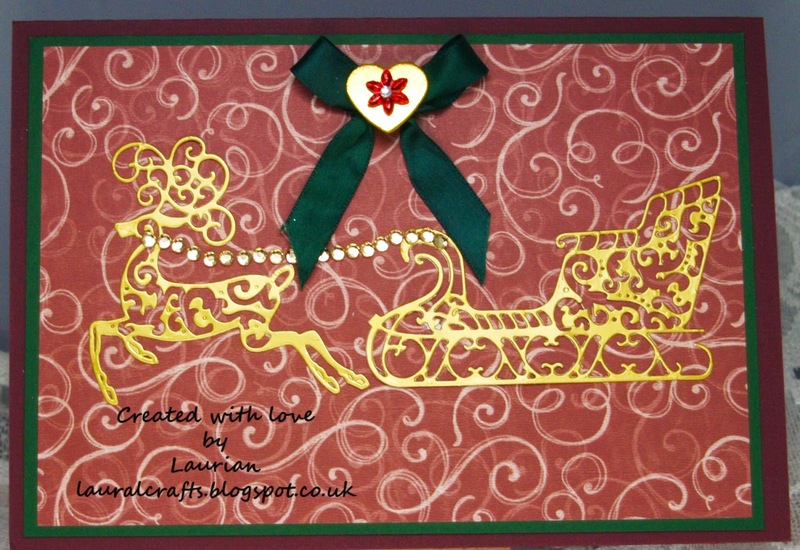 The lush paper is from a Tonic kit I got recently and the reindeer and sleigh are cut with some DiSire dies and I love them, lol! The rhinestones are from Mei Flower and are very good value, then I added a nice bow to finish off. I do hope you come on over to the Outlawz Colour Challenge this week - its the last week for a chance to win some digis from Squgglefly so what are you waiting for!